Discussion in 'Trek Gaming' started by StarTrekRecuts, Sep 26, 2018. Stage 9 made 3D artwork and not copied verbatim and posted it on the website that they own. It still doesn't fall under fair use as they are still using some one else's property in a non-transformative way, that was not educational or a parody. If there is a problem with the law then act on that. But I'll not take CBS to task for operating within the bounds of the law and protecting their property. Any more than I get mad at Deviant Art artists who take down all their art because its constantly getting stolen and reposted elsewhere with no credit or compensation. With due respect to Stage 9 they did not own the intellectual property they were recreating. BillJ, CRM-114, Tuskin38 and 1 other person like this. Yes but they're allowed to do it because of the 5th amendment: "nor shall private property be taken for public use without just compensation" Because you're talking about youtube taking action against you on their own property it's like someone is legally allowed to kick you out of their own home . It's a separate question from the stage 9 issue because you don't own youtube.com. Stage 9 made 3D artwork and not copied verbatim and posted it on the website that they own. the Stage 9 team does not own the Star Trek IP, they don't have the right to keep making it if the owner of said IP tells them to stop. eh not seeing any harm done to star trek from this. Not your decision to make. I think that fella must have studied law with His Majesty, Lord Precious Pants. BillJ, Jedman67 and fireproof78 like this. Clearly you’re wrong since it happened. fireproof78 and Jedman67 like this. Because if CBS ever wants to sell a license to another company, the Stage 9 project would be in direct competition to said licensee. And reading between the lines, I suspect that perhaps such a thing may be in the works. Otherwise, I don't see why CBS refused to talk with Stage 9 about possible changes. I mean, if I was going to approach CBS with a new game idea like this, I would want to develop a proof of concept to show them that I was actually capable to making the product. I thought that's what Stage 9 started out as, no? CRM-114 and fireproof78 like this. Anyone can send a cease and desist. That can be given to fulfill a requirement to inform them that they may be breaking the law but the burden is still on them to prove a law is broken. Admittingly I wouldn't enjoy trying to defend why it's not breaking the law though. It would require a lot of thought and open minded judges. Since it is using another person's property and not in a way that is transformative, educational or a parody, and has the potential to impact CBS' market share, if not now than in the future, as well as CBS' ability to negotiate with other licensees, I do not think fair use applies. But, I'm no lawyer, and clearly neither party wanted to go to court. At some point in time there needs to be a respect for the property owner's rights to do with their property what they want. 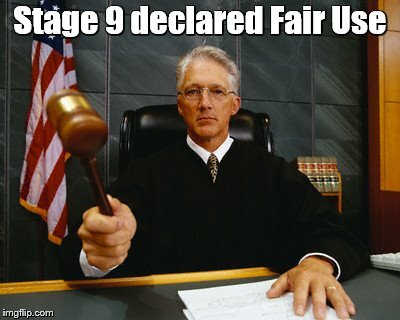 Otherwise, I don't see why CBS refused to talk with Stage 9 about possible changes. We could rally for abolishing intellectual property rights in general if people can agree that owning intangible things like ideas shouldn't be allowed. Can look for petitions similar to this and sign it https://www.change.org/p/the-presid...ish-all-forms-of-intellectual-property-ip-law contact your local congressmen too. I agree on this point. I was actually thinking of linking to similar petitions. My larger point is that right now the current law is what CBS is operating under. It is irrational and unreasonable to expect them to not defend their IP under the current law. Regardless of what would be preferred in the world, the world can only be dealt in terms of what is currently, not what it is wished to be. If by "we" you mean "you," knock yerself out. I'll pass. I propose that we get as many fans as possible to band together and make as many fan films as we possibly can all at once, if possible. The length or content won't matter, as long as there are a lot of them, and if they break their so-called fan film "guidelines," so much the better. It would be a coordinated effort of sticking it to CBS. They will have so many cease and desist orders to file that they just won't bother. There's more of us than the CBS suits think. It's a complicated plan, and yes, it sounds naive, but it may work if hundreds of us participate. We can avenge Axanar and others! As long as we're dreaming, can I wake up tomorrow having lost sixty pounds overnight? Same here. That would be nice. Sixty? No, but my doctor keeps telling me I need to drop about thirty. Okay I came up with something that might work. Stage 9 could bring their site back up and say that they're going to keep the site going as a form of peaceful protest which is protected by the First Amendment. Since they aren't hurting anyone then there shouldn't be anything anyone can do about it. I would love to see how they'd respond to that. Even if it's argued that they're financially hurting CBS, that could be like how black people sat on bar stools as a form of peaceful protest against segregation hurting business that way but still legal. It reminds me of when they tried to legalize ddos attacks with this approach. As a writer, I find that TERRIBLE idea, I LOATHE it and wish it was set on fire. Copyright protects the little guy and gal just as much as the corporations. AND, let's get your facts straight, YOU CANNOT COPYRIGHT AN IDEA. A copyright is given to the execution of an idea. You are not entitled to everything because you want it. BillJ, CRM-114, Jedi_Master and 6 others like this.